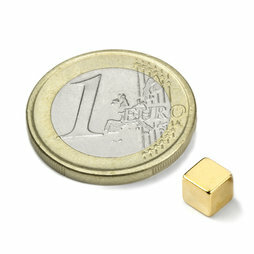 Same cube magnet as the W-05-N, but plated with real gold. Looks even classier. This magnet works especially well on magnetic paint. 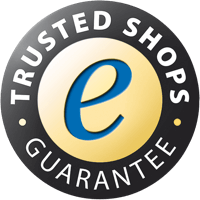 A customer wrote: "Now I no longer have to search around." Our customer Kai Annies wrote: "Several gold-coloured cubes hung on a string begin to point themselves towards South immediately and it's astounding with how much power they do this!" A customer made these beautiful dragonflies and combined them with magnets. You can see the gold-coloured cubes on the dragonfly feet in the close-up. Raphael Rickmann from Schlieren sent us this photo: "This 50 cm high, virtually true-to-scale representation of the Pantheon was built by my father with about 8 sets (Z-01 and Z-05) and just about 1000 W-05-G magnets. My father is really hooked..."
Deike Banser from Bremen bought simple wire netting from the do-it-yourself store and produced a original design piece. She hangs photos with small magnetic cubes and entire key rings with the somewhat longer rod magnets. This can catapult a marble for meters!